For all you British people out there and those who like British food, we have here a traditional dish. 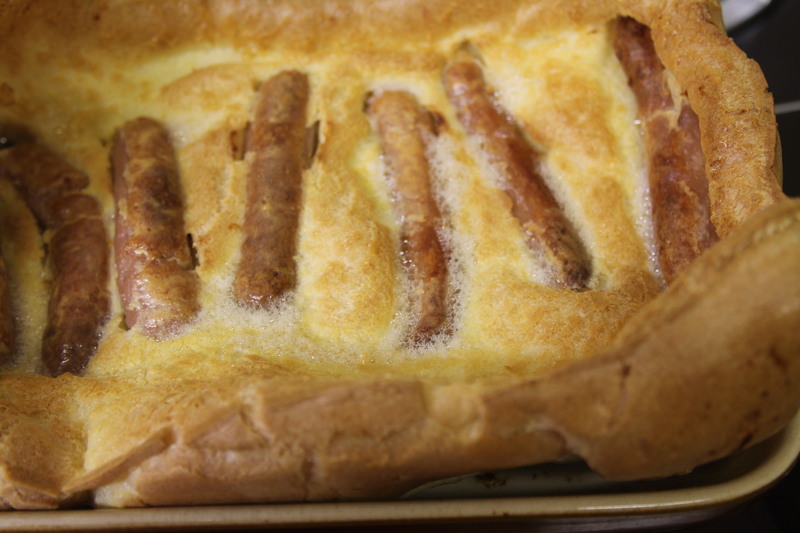 Toad in the Hole is Yorkshire pudding batter poured round sausages, baked in the oven and usually served with an onion gravy. It uses a Yorkshire Pudding batter and you can use any sausages you like but I prefer it with skinless ones. Make the batter and leave for half an hour before using for best results. The oven needs to be very high, gas mark 8 or 230 C or 450 F. You will need a suitable shallow metal tin. Mix all the ingredients together either by hand or with a machine and then leave to rest for half an hour whilst you prepare some potatoes and/or vegetables and the gravy to serve with it. The mixture should resemble single cream. Place the sausage in the tin with some dripping or lard and cook for about 10 minutes. It is very important to keep the tin and the oven hot so take the partly cooked sausages out of the oven (closing the oven door) but not too far away and very quickly pour the batter onto the sausages in the tin and replace the tin in the oven immediately. Cook for a further 20 – 30 minutes depending on your oven. Serve immediately with a brown onion gravy and lots of fresh veg.